Nothing will put a damper on your trip faster than lugging clumsy, heavy luggage around crowded airports, up stairs, and over bumpy sidewalks. Even worse? Spending a week in the same clothes because your bag never arrived. Want light, happy, stress-free travels? Start with these minimalist packing tips. Is it mix-and-matchable (for clothes and shoes)? Is it easier to buy it when I get there? It’s not just about what you put in your suitcase, but also the packing gear itself. Start with carry-on friendly, light, sturdy gear that will keep the weight down and all your stuff organized. First things first, research the carry-on limits and size restrictions for your airline. Many budget airlines aren’t so budget anymore once you factor in checked or oversize luggage. I recommend finding the lightest carry-on you can (every ounce counts!) that will fit in the overhead compartment. A lot of travelers love Away. I personally use this carry-on* and it’s great. Sometimes they don’t fit nicely together in my suitcase; that’s my biggest complaint. 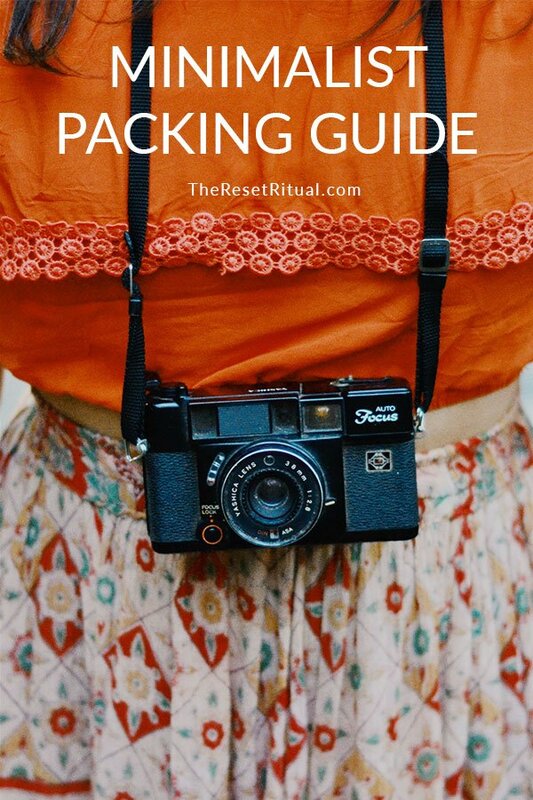 I’d still recommend packing cubes though if you’re going on a long trip, sharing a suitcase or for any other situations when it’s important to stay extra staying organized. In addition to a carry-on suitcase, I usually travel with a tote bag or backpack. This is where I store my passport, wallet, phone, toiletries and other in-flight essentials. Anything that will need to be unpacked to go through security (like liquids and laptops) should be in this bag so they’re easily accessible and returnable. You can always rearrange once you’re at the gate. Since most airlines only allow one carry-on and one personal item, I put my purse and/or camera bag into my tote or suitcase. Easy peasy. When choosing an everyday handbag for travel I look for something that can be used day and night. Crossbody bags are great because you can keep them in front of your body so everything you need is within reach, not to mention help prevent purse snatching and pickpocketing. This stylish camera bag from Gatta also functions as my purse. It’s my new favorite! Believe it or not, with a smart strategy and a bit of creativity it’s easy to pack light while looking stylish and feeling good. Of course, research the weather before packing. Check out fashion blogs in the area to get an idea of the style. Also, don’t forget to consider cultural or religious activities that might require you to cover your shoulders and knees, like visiting places of worship. When packing clothes, try to bring as many multifunctional items as possible. I love the Chrysalis Cardi from Encircled, which goes from scarf to casual dress to fancier dress to top to skirt…I could go on. Dresses, in general, can be multifunctional if you pair them with a top or sweater or with another skirt. This video has great examples of how to style one dress multiple ways. Next, create your travel wardrobe color palette. Choose one neutral color, then punctuate with a color palette that’s easy to mix and match. Decide on your neutral color. Think black, gray, camel, brown or navy. I’d stay away from light neutrals like white and cream for travel. Pick your palette. Decide on 1-2 colors that go well together and with your neutral color. This way you can create a wide variety of outfits with fewer clothes. Think about what activities you have planned, or if you don’t know, consider the vibe of your trip. Is it all about action and adventure, city-strolling or hanging out at the beach all day? Most of the time, you can bet on walking a lot. So comfy shoes are a must. In warm weather, go for a pair of casual sneakers* and flat sandals* that can go from day to night. In cooler weather swap in booties instead of sandals. Once you have your two go-to pairs, you might need to bring one more pair such as flip flops for the beach or pool, heels for a fancy dinner or special sports shoes. Don’t bring more than three pairs, and usually, two is enough. If you’re finding yourself struggling for space, consider wearing your bulkiest shoes on the plane. If not, I’d recommend wearing shoes that are easy to slip on and off. Scarfs, jewelry, a belt or hat can go a long way in giving your outfits personality and variety without taking up a ton of space in your suitcase. Try packing small jewelry in pill boxes so they don’t get lost or tangled. Along with clothing, toiletries are also a big culprit of over packing. You don’t need to bring shaving cream or your own loofah, people! And remember, if you forget it, most likely you can buy it. Want more specifics? Check out my beauty and wellness travel favorites. In this category, multitasking is key. Focus on double duty items like cleansing oil and moisturizer with sunscreen. Coconut oil is a fantastic multi-use product. (You can even get coconut oil travel packets*!) So is Dr. Bronner’s soap. You can wash your hair, body, face and even your clothes with it. Plus it’s natural, vegan and non-toxic. Check with your accommodation to make sure they provide a hair dryer (most do) and leave the curling iron at home unless you know for sure you’re going to use it. Foundation, concealer, one lip+cheek stain, an eyebrow pencil, mascara, one eyeliner. Maybe one eyeshadow that can double as highlighter or a bronzer that can double as eyeshadow. Do you really need anything more? Another makeup packing tip is to bring items that don’t need a brush. I went brushless in my everyday routine and I love how simple it is to get ready in the morning. Travel can do a number on our immune systems, sleep cycles and digestive health. I like taking individual packets of green powder with probiotics* for overall health and magnesium* for muscle relaxation and stress relief. Melatonin is also great for regulating sleep hormones. For period days, I swear by the DivaCup*. Menstrual cups are safer for your health and more environmentally friendly than tampons. Plus, you can keep it in for 12 hours, which is awesome for travel. As fun as it is, travel can also be stressful, energy draining and make you feel uncentered. That’s why it’s important to keep up self-care routines on the road. Think about bringing your favorite tea bags, a travel journal and calming essential oils. * Download meditation apps. If you have room, a travel candle is a lovely, grounding item to bring with you. Remember those little plastic bags I mentioned at the beginning. That’s where you’ll want to put all of your cords and electronic odds and ends for easy organization. Do you have any favorite packing light tips? I’d love to know!